Snack-Girl is a working mother and sometimes she doesn't get around to things as timely as other food writers. I would say most food blogs featured deviled eggs last week. Now that I have 2 dozen Hard Boiled Eggs in my fridge, I am ON IT! Fortunately, Hard Boiled Eggs keep for 7 days in your fridge. Deviled eggs are delicious. Of course, when you add 1/2 cup of mayonnaise to just about anything it tastes delicious. Mayonnaise is 90 calories per tablespoon. It is a mixture of oil, egg yolks, and salt. Here in the test kitchen (my kitchen), my family helped me come up with a lighter recipe we have named "Angeled Eggs". The recipe features Dijon mustard which has a mere 5 calories per tablespoon and is very creamy (like mayonnaise). Dijon mustard is from Dijon, France. As we know, France produces and drinks a lot of wine. So, they add it to their mustard in Dijon and the taste comes out less bitter than yellow mustard. You can find tubs of Grey Poupon at Costco, and it keeps forever so go ahead and buy a tub if you like the stuff. Dijon does have a snobby reputation. Cue British accent -"Pardon me, would you have any Grey Poupon?" If you are too young to know the reference here is that famous commercial: Grey Poupon Commercial. Amazing what you can find on YouTube. Candidate Barack Obama was chastised for asking for Dijon for his burger at a restaurant. A potential campaign manager actually told him that he didn't want Dijon mustard. Crazy, no? Dijon makes great "angeled" eggs. Combined with a little mayonnaise and diced roasted red pepper (need to add your veggies! ), it tastes great. You can find roasted red peppers in jars in the canned vegetable section of your supermarket. They are great to have on hand to add to salads or sandwiches. Buy the roasted red peppers that are stored in water. My kids really enjoyed making these with me. Peeling the eggs, mashing the yolk and then spooning it back in the white was easily handled by my 5 year old. Eggs are really packed with nutrients so I am glad when my kids eat them. Peel hard boiled eggs, slice in half and remove egg yolks. Place egg yolks in a bowl and mix in mustard, mayonnaise, and roasted red peppers. Adjust seasons and spoon back into egg whites. Serve at room temperature or cold. If serving 4 people, each serving is 4 egg halves (which is about 150 calories). For one serving = 148 calories, 2.9 g fat, 2.7 g carbohydrates, 11.5 g protein, 0 g fiber, 265 mg sodium, 2 Points+ PS: To hard boil eggs, place them in a sauce pan. Cover with water, bring to a low boil for 12 minutes. 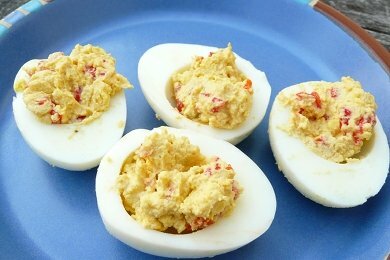 What do you add to your deviled eggs? What Would You Do if THIS Was In Your Fridge? Yum that looks tasty! Having "Angeled" Eggs is such a cute idea. Delicious ~ I LOVE the mustardy idea. I like using half mayo and half greek yogurt to lighten it up as well. All the creaminess without the fat plus a little protien. Celery, onion, pickles (dill or sweet), carrots, and mayo. Grey poupon is optional. All veggies are finely chopped. For color, add some paprika and 2-3 slices of stuffed olives to the tops of each egg half. Yumm! Yum - this sounds great, and better than those recipes using reduced fat mayo - which usually has more "weird" ingredients on the label than the regular stuff, and that, to me, negates it's potential "healthfulness". I make curried eggs. A bit of onion, some dill pickle, mustard, and curry powder. Mayo or yogurt (or sometimes cottage cheese) for a bit of moisture. Yum-O! I've always made my deviled eggs with mostly regular mustard, a dash of horseraddish and a small glob of mayo. Will try dijon, next time. My Wisconsin born grand mother in law makes hers with diced green onions and bacon in the mix. And I LOVE the diced peppers, would have never considered that, adds a crunch! I always use Horseradish in my devil eggs. It gives the eggs a great kick! It is a family tradition and well loved by all!